BIG TURNOUT FOR LIFE: The March for Life, which took place Saturday at the Statehouse, drew bigger crowds than the recent Women’s March, but received less media attention. 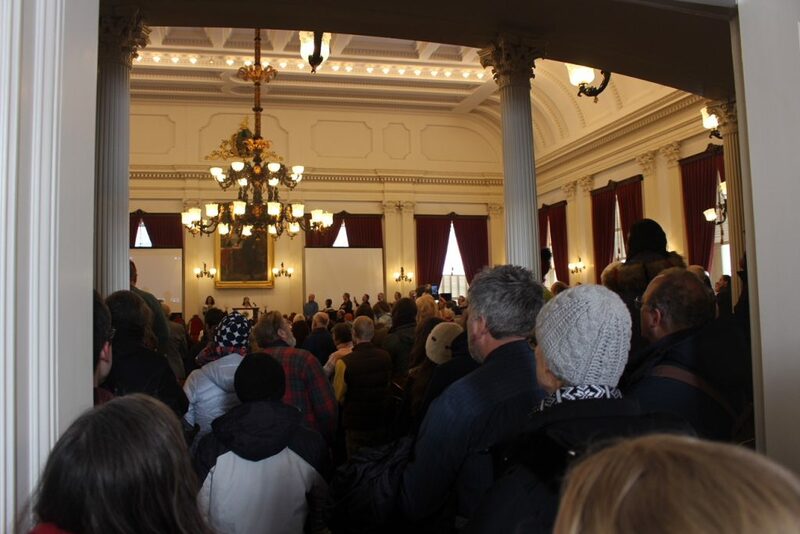 MONTPELIER — If the numbers in the streets were any indication, the Right to Life march on Saturday shows the anti-abortion movement in Vermont is every bit as politically engaged as the pro-abortion Women’s March from a week ago, if not more so. Before noon, over 500 pro-life activists took to the streets and marched from City Hall to the Statehouse. Despite the large crowd, local media coverage of the event was thin at best. The event took place as Democrat and Progressive state lawmakers seek passage of H.57, which states women have a “fundamental right” to kill a child for any reason up to the moment of birth. 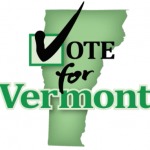 “A fertilized egg, embryo, or fetus shall not have independent rights under Vermont law,” the bill states. 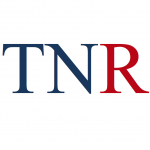 The measure goes well beyond the language of Roe v. Wade, which allows for government restrictions on abortion in the second and third trimesters of pregnancy. The march also occurred against the backdrop of more than 60 million babies aborted in the United States, according to statistics from the Centers for Disease Control and Prevention. Some 62 percent of all abortions are minority babies. Vermont currently has no regulations on abortion, meaning the procedure can be performed at any time during a pregnancy. Abortion also is guaranteed by the state legal precedent of 1972’s Beecham v. Leahy, which preceded the U.S. Supreme Court decision in Roe v. Wade. 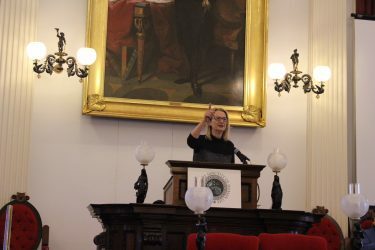 Ann McElhinney, a NYT best-selling author, journalist, film producer and director, speaks from the podium in the Vermont House of Representatives on Saturday, Jan. 26, 2019. The featured speaker in the Statehouse was pro-life activist and film producer Ann McElhinney. She and her husband, Phelim McAleer, produced the movie “Gosnell: The Trial of America’s Biggest Serial Killer,” which is based on the New York Times bestseller of the same title. The film focuses on Kermit Gosnell, the former physician and abortion provider who was convicted of first-degree murder in Pennsylvania for the deaths of three infants born alive during abortion procedures. He also was convicted of manslaughter of a patient and 21 illegal late-term abortions, among other violations. The film screened shortly at a local theater after her speech. In addition to describing how the Gosnell murders transpired, McElhinney highlighted a famous photograph of the empty benches in the press section of the courtroom. With Vermont having no abortion restrictions and the most Planned Parenthood clinics per capita in the nation, McElhenny added that the things that happened with Gosnell in Pennsylvania could very well be happening in Vermont. “I think many of you are here today because of the things that you know about this place, about Vermont, about what goes on in here in this state that people think is OK, that people say is law,” she said. State Rep. Vicki Strong, R-Albany, marched with other participants despite Saturday being the anniversary of her son’s death while serving in Iraq. She told True North about the atmosphere in the Capitol. 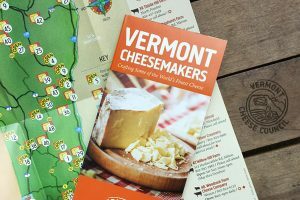 “It’s always a friendly crowd, a considerate and polite crowd, and I think a God-fearing crowd — which is fun, for being here in Montpelier,” she said. Also in the crowd was Paulette Rocheleau, of Swanton. David Morse, of Woodbury, talked about how there’s much work to be done to protect the unborn. According to LifeNews.com, 79 percent of abortion clinics are in minority neighborhoods, as of 2012. Mary Beerworth, executive director of Vermont Right to Life, also spoke in the House chamber after receiving a lengthy standing ovation. “Listen, you are all rockstars in our book. You are what makes it possible for us to go in the Statehouse and stand up for life. You are all famous to us,” she said. it’s enlightening to see this gathering but again it was downplayed by Liberal news. receive a fee and charge taxpayers for there foolishness is disgusting !! Great Story Michael…….Vermont digger seems to have missed this, certainly no coverage like they gave the smaller event. It’s interesting, if they get this passed and even if they don’t we need to drastically revamp our laws. Clearly if women only have tissue/fetus and there are no human considerations then the state and men are not responsible in any fashion for bringing a baby into the world. Men would be responsible for getting women pregnant and only responsible for getting women unpregnant, nothing more. Also the state can stop supporting women immediately with aid, because it is only the woman the chooses to make a tissue a child, she should not be able to have the state pay for rearing a child when it was her sole decision to do this, it was her choice to change a tissue into a baby. This would unfortunately make any medical procedures to save a premature baby, to not be on policy, because it’s only tissue. The only time it’s a baby is after the mother has given birth. So Vermont could be the leader in pro-life if they hold those who are of the belief they have tissue inside them until time of birth. 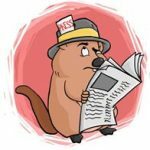 These changes would be in line with their thinking and platform. Interesting times, people can’t just make believe and be inconsistent to the point of absurdity. Their has to be some logic involved, science, natural truths, timeless truths. Science and the Judeo/Christian teachings are in agreement on so many aspects of life.